Sorry this can't be shorter, but for those of you who might really like to understand what is involved in working outside the system, I feel I need to lay it out as clearly as I can, which may take a few blogs. First, back in the day it never occurred to me that I was being an entrepreneur, nothing like that. I was trying to survive in a world into which I did not quite fit. Given my demands on myself, I had no choice. I only knew how to do what I loved, and little else. After all, I had pretty much shut school out for thirteen or so of my formative years. When I dropped out of high school, I was still pretty much virgin as far as indoctrination was concerned. And there is a reason for that, at least one I tell myself when I think about it, and it involves Mother Nature. I have told this part of the story here before. Basically, I was raised in Lancaster County, Pennsylvania in a house my parents had built, the only house out in the countryside where we lived. Sure, there were homes a quarter mile away, but I was a little kid. Our house stood between two very large farms, so there was nothing but fields and meadows, with crops like tobacco growing right at the end of our backyard. My mother was a local artist and she would meet with other local artists here and there. One place where they met was at the farm of artist Phoebe Dodge. Mom took me along sometimes. It was a lovely place and, aside from being an artist, Mrs. Dodge was also a naturalist. She took an interest in my interest in animals and such, and before long I too was a naturalist. I cannot thank her enough! At the time I was perhaps six years old. I can still remember emerging soaking wet with all my clothes on from her pond with a large water snake (and it was biting me) in my hands. I was so proud, but I'm sure mom had other thoughts, but I digress. The point of telling you this is that as a young kid I became fixated on nature in all its beauty. Mother Nature and I were in lock-step and that fixation stood by me all the way through my school years without a blink, in fact, until my middle teens when I discovered, of all things, girls. Girls were even more interesting than natural history. So, all those years I was more-or-less immune to school and any attempts to train me through the education process. I knew very well how nature worked and she had my respect; nature is a tough lady. Unless you could offer me something that authentic (and I am speaking here to society), you never appeared on my radar screen. It was as if you didn't exist, at least in my world. At recess, when the other kids were playing dodgeball, I was digging out Stag Beetles in the old rotten stumps at the edge of the playground -- that kind of thing. My point here is that Mother Nature had inoculated me against all the rules and laws of society, and then upped the ante by raising the bar when it came to getting my attention. It made perfect sense for me to later discover that Buddhists say that the dharma and natural law is the same thing. Just as in the dharma we have lamas or teachers, the Tibetan Buddhists also acknowledge what they call the "Lama of Appearances." Nature was my lama for all those years. And I learned early on that we don't break nature's laws; they break us. However, it is obvious that we can get around society's laws. That's what lawyers are for. I was following nature's laws. And I take up all this time here just to point out that natural law (how nature actually works) was an essential ingredient in how I learned to work in this world and make a living, which is what I am trying to get to in these blogs. Nature has laws by which we must live if we want to survive. Keep in mind that just about every critter on earth is struggling to find some other critter to eat, while at the same time living in fear of being eaten. That is some tough love, my friends. Therefore, leaving the beaten path and just stepping beyond the rules of society, as entrepreneurs as said to do, is like a marriage, not something to be taken lightly, but something that should only be entered into with some trepidation or at least respect for the consequences, because there are some. Just because we want to "do what we want" does not mean we can get away with it for long, so please take note. 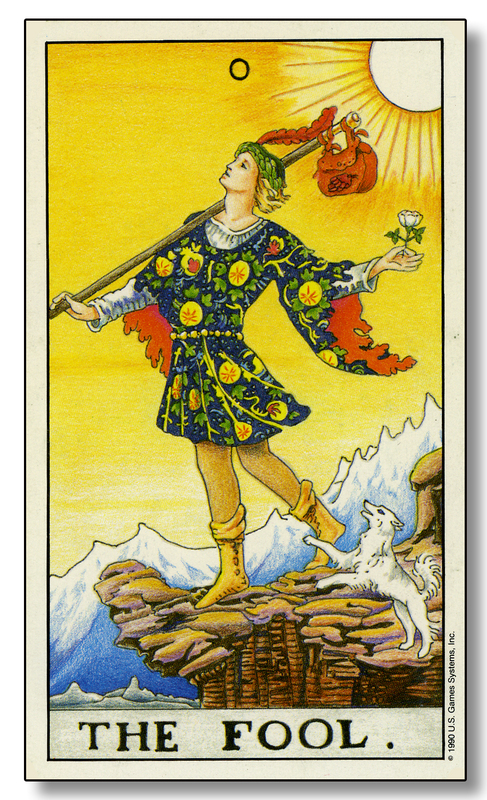 And my refusal to play by society's rules was not a step that I blithely took as in the tarot image of "The Fool" by the artist Pamela Coleman Smith in the Waite Tarot Deck (shown here), throwing caution to the winds, so to speak. No, it was quite deliberate on my part and fraught with 'fear and trembling' every step of the way, at least in the beginning. Mine was a calculated risk, but one driven by the heart, not by the probabilities of the mind. I was not willing to give up any heart. I don't know who it was who said that civilization is the corruption of infants, but there is some truth to that thought. In some ways, my dedication to natural history, my refusal to be distracted by the educational process because it was uninteresting to me, had left me somewhat immune to society's natural function of indoctrination. It would be like someone reaching the U.S. Congress without being corrupted by the very process of getting there – unlikely, but it happens. Mother Nature did that for me, and when I reached the age where I had to "go along to get along," I naturally, and I mean "heartfelt-naturally," opted out, not from spite or hatred, but simply because when the fork in the road appeared, I took the path of my heart, not that of reason, and I did this without a second thought. It was natural for me. So I was not on a vendetta, but just behaving normally. I was not even angry at what society by its very nature was forcing people to do, like many are today. I had no axe to grind. I was just used to doing what I loved to do and had done all my life, which was to follow my heart. This is not to say that I was not tempted by the "siren song" of society; I did not even plug my ears as it called to me with its various promises. Nevertheless, I just could not follow those rules; too much would be lost that I had found to be essential. This is perhaps why Margaret and I chose to homeschool some of our children, like my daughter May and my son Michael. So I stuck to what I knew, doing what I felt was true for me, rather than risk losing heart under society's tutelage. Heart is important, which is why our outreach for the last 40+ years has been called the "Heart Center," because having heart is essential, so take heart! I was not so crazy as to go beyond all job-security into the unknown wasteland beyond society's rules and be lost forever. I had to live somehow, even if very meagerly, so how? That was no problem when I was single. It was a bargain to do toilets and get away with my soul intact, a done deal. Even when Margaret and I married, she was a kindred soul and we happily lived on next to nothing, with few complaints. However, when kids began to appear on the scene it was a different story. When single, I was inherently responsible enough not to give up my soul for life as what I considered an indentured servant, and when kids came along I was equally responsible enough to "give up giving up" and get with the program, albeit marginally. The trick was to find something that society needed that I was willing to do, not an easy task since my main life interest has always been esoteric initiation into life-mysteries, mostly topics no one has ever heard of, even in my blogs here. Unless you are a pure scientist of life and have no other responsibilities except for your own hair-shirt, there always has to be something between your interest and the marketplace, just enough to make a living. And that "something" we will call your job or moneymaker, although it can be very transparent if we wish, i.e. we don't make much. I can remember one very clear moment when I was researching astrology via computers (and living on about nothing), busy programming techniques that had never been carefully looked at before, at least not looked at by someone like me. It was just after I wrote an entire astrology program that resided in 8K of RAM! Even to record a sneeze would take more ram that that these days. My program included the Sun, Moon, and planets to an accuracy of about one-minute of arc, including geo, helio, azimuth, and Prime Vertical, charts and more. And I was giving the program away to any fellow astrologer interested. The downside is that back then there were no disk drives, so the programs had to be copied (and then verified!) by tape cassette. Pretty soon I was spending much of my day copying, packaging, and mailing tapes to people all over. Meanwhile I had a family and was struggling to exist. One morning a clear vision came into my mind, very much like a direct-voice message, and it said I had a choice. I could stop providing tapes to all and sundry and stick to my research or I could start to charge for my work, which would require copying, etc. each day, leaving the rest of my time for research. Of course, I chose the second option and Matrix Software was born, which probably affected my research, but saw that my family and I could eat and have more than the bare necessities. In an article done on my for Red Herring magazine, the author states that aside from Microsoft, my company is the oldest software company on the Internet. My point: Be practical enough to exist, but impractical enough to have room for some blue sky in your life, however that might appear. We have to have at least one foot in the practical door to stay alive. I never took differential calculus and don't really know what it is, but I imagine, if it has to do with differentials, making compromises, I might be a bit of a genius at that. And that is because my life, even though I paint it here as outside the mainstream, has been nothing but continual compromise, although what you and I are willing to compromise on is where we might differ and find our differences. And "compromise" here might be defined as how we make a living. This blog is already too long for one day, so: "To be continued," as I can. The message here is that entrepreneurs have (and have-to-have by definition) a practical bone in their bodies, otherwise nothing of use would ever materialize. So, be ready to compromise something of value at least to some degree, if you want to be successful. I have zero respect for those who spend their time complaining, when they could be doing something about it. I am a natural astringent when it comes to bleeding of the soul.